The Multi-stripper is an easy to use machine for removing floor coverings, tiles, etc. Seperate the earth from the stones for reuse in the garden. Turn waste into a reusable raw marerial. ﻿If you’re undertaking a job and need equipment to make it easy or safe without costing the earth, then choose us. We have a comprehensive range of different specialist tools and plant. Through a combination of our own expert knowledge and our previous customers’ experiences, we can advise you what’s best for your project – saving you time… and money! Come in and have a look, watch the informative videos on the website or give us a call. We are there to help you get the best use of the machine, and if it saves, then we are all happy. 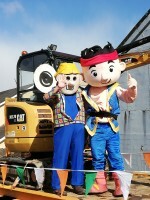 West Cork's premier tool hire company! Serving both Skibbereen and Bantry areas with Quality Tool Hire.